Many cellular processes depend on complex proteins that share characteristics with machines. Our aim is to understand molecular machines at the atomic level while answering important questions relating to the biology of cells. Our main area of research is the bacterial cytoskeleton. We have been involved in showing that prokaryotes contain both actin and tubulin-like proteins that polymerise in vivo and in vitro into filaments similar to their counterparts in eukaryotes. 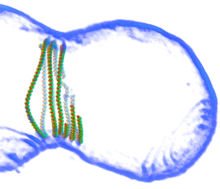 FtsZ, the bacterial tubulin homologue is part of the cytokinetic ring around the septum during bacterial cell division. We are trying to understand the dynamics of FtsZ-orchestrated cell division in vivo and by reconstituting parts of the process in vitro. Bacterial actin homologues include MreB and ParM. We investigate MreB fibres that control bacterial cell shape and that are perpendicular to the long axis in rod-shaped cells. 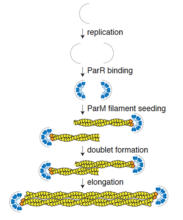 ParM is a plasmid protein and forms bipolar spindles that push sister plasmids to the poles, a very minimalistic version of mitosis and a very elegant and simple system to study mechanistically. In order to understand these systems and their mechanisms, we investigate at the level of cells with fluorescence light microscopy and electron cryo-tomography, at the level of molecules with electron cryo-microscopy and we use X-ray crystallography in order to image atoms.